FLORIDA: Broward County Elections Official Resigns - Joe.My.God. 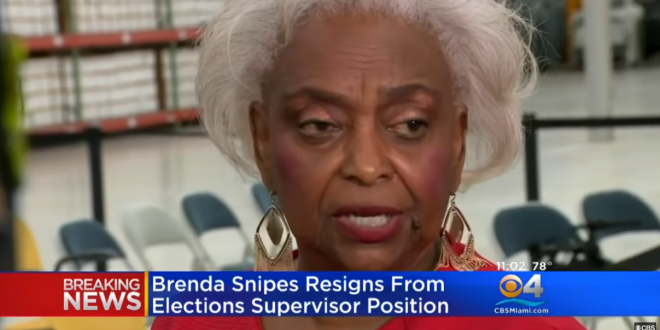 The supervisor of elections for Broward County, Florida — Brenda Snipes — who has faced national scrutiny in recent days for her county’s chaotic performance during the recount in the Florida Senate and gubernatorial races, resigned on Sunday. Her county’s performance during the most recent recount — which was delayed by faulty machines and missing ballots, prompting Gov. Rick Scott (R) to make unsubstantiated allegations of voting fraud — is just the latest in a string of mismanaged election issues in Broward under her supervision. Though she was originally appointed to her position in 2003 by Republican then-governor Jeb Bush, Snipes clashed with Scott, another Republican seeking power in the state. The Supervisor became a target of Republican vitriol after the recount effort began. Sen. Marco Rubio and President Trump both publicly criticized her. Even Bush, who appointed her, took to Twitter to condemn Snipes handling of the election.